As a successful facilitator, you know the importance of the resources in your professional toolkit. How you engage your audience and improve learning can be affected by how well you use them. But mastery of PowerPoint evades many. Feedback on presentations can range from "What was the point?" to "That changed my life." Most, though, fall closer to the former. If you are looking for a guide to the PowerPoint practices that will push your presentations into the latter category, look no further. 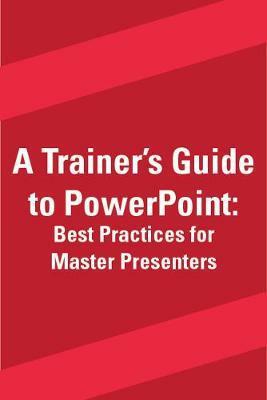 A Trainer's Guide to PowerPoint: Best Practices for Master Presenters is Mike Parkinson's master class on the art of PowerPoint. While Parkinson wants you to understand how amazing a tool PowerPoint is, he's the first to tell you that there is no magic button to make awesome slides. There are, however, proven processes and tools that deliver successful PowerPoint content each and every time you use them. In this book he shares them, detailing his award-winning PowerPoint process and guiding you through three phases of presentation development-discover, design, and deliver. What's more, Parkinson is a Microsoft PowerPoint MVP-most valuable professional-an honorific bestowed by Microsoft on those with "very deep knowledge of Microsoft products and services." He shares not only his tips and best practices for presentation success, but also those from several of his fellow MVPs. Parkinson invites you to master PowerPoint as a tool-just like a paintbrush and paint-and to realize that the tool doesn't make the art, you do. Mike Parkinson is one of 16 Microsoft PowerPoint MVPs in the United States. He is a PowerPoint and visual communication expert, a professional speaker, an educator, and an award-winning author. He regularly conducts workshops and creates graphics, presentations, and content for companies like Microsoft, FedEx, Xerox, Dell, and Boeing, as well as for learning institutions and small organizations. Mike is the owner of Billion Dollar Graphics (BillionDollarGraphics.com) and 24 Hour Company (24hrco.com) and author of a successful visual communication book, Do-It-Yourself Billion Dollar Graphics.